and on a four string bass. Whether you use a pick or your fingers to strum your guitar or bass, there are only two ways to strum efficiently: alternate or toward. The definition of efficient is less energy. Less energy means less strums. And less strums will result in much faster technique! The following two strum suggestions will help you play more efficiently when strumming with a pick. 2) When tones move to a different string, you strum toward that string. The definition of toward is “in the direction of.” For example, when your fretting finger moves down to a lower numbered different string, strum down toward that string. Conversely, when your fretting finger moves up to a higher numbered different string, strum up in the direction of that string. The down stroke sign looks like a staple and the up stroke sign looks like a V.
To help you strum the following exercise with even greater efficiency, begin with a stroke up. 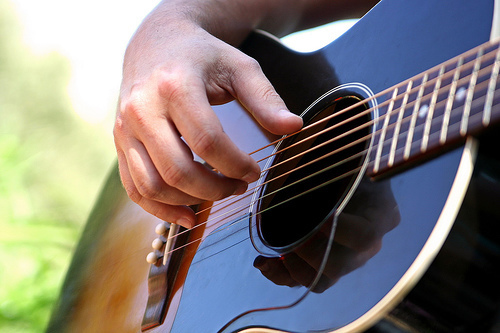 The following two strum suggestions will help you play more efficiently when strumming with your fingers. 1) When tones are on the same string or move down to a different lower numbered string you use you use alternate strums. Remember, the definition of alternate is to switch back and forth one after another. For example, if you are playing tone 2 with your m finger, you will alternate and play tone 3 with your i finger. 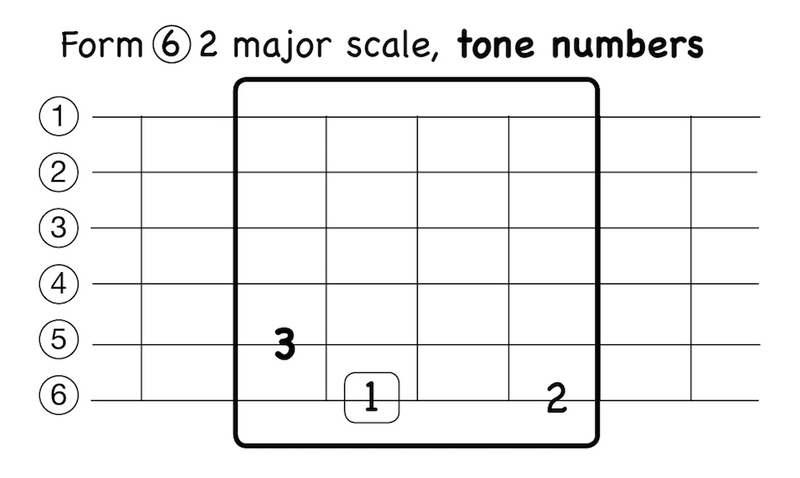 However, if you are playing tone 3 with your m finger, you will use the same m finger to play tone 2 on the higher numbered adjacent string. In other words, you use alternate strums except when the next tone is on a higher numbered adjacent string. In that case, you strum with the same finger toward that string. Your index finger is i and your middle finger is m.
To help you strum the following exercise with greater strum efficiency, fingers i and m are shown. ’til next time, have some efficient pick and finger strum fun… I’ll be listening! One octave has 12 sounds and 21 letter, tone, and staff note symbols: 7 (natural) + 7# (sharp) + 7b (flat) = 21 symbols. Now, the question becomes: are there 21 major scales? The simple answer is yes – but to spell them we need more than 21 symbols. For example, we can easily play a G# major scale, but to spell it we need a double sharp symbol: G# A# B# C# D# E# F##. The same is true for the Fb major scale: easy to play, but to spell it a double flat is needed: Fb Gb Ab Bbb Cb Db Eb. Said a different way, the reason why there are only 15 traditional major scales is because there are only 21 symbols from which to spell – and you can only spell 15 major scales with those 21 symbols! In other words, to spell any other major scales, not listed below, we would need additional double sharp and double flat symbols. Notice that even though each major scale has a different letter spelling, they all have the same tone number spelling: 1 2 3 4 5 6 7. Traditional music theory call tone numbers, scale degrees. The different letter spellings are the result of applying the major scale interval pattern (2 frets – 2 frets – 1 fret, 2 frets – 2 frets – 2 frets – 1 fret) to each of the 15 traditional major scale letter spellings. 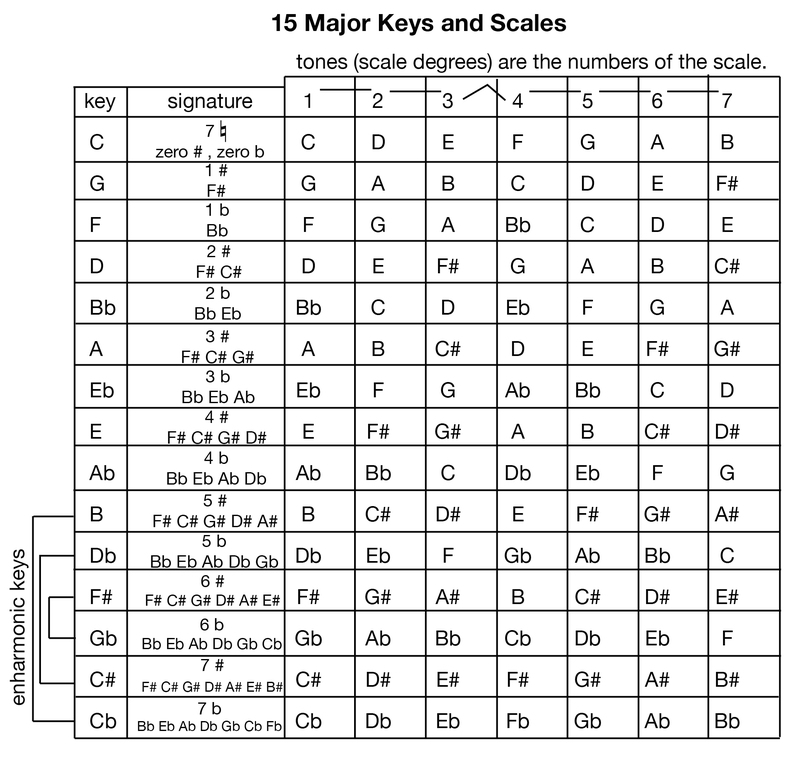 In other words, there are 15 major scales, in 15 major keys, that are known by their 15 major key signatures. See Guitar EncycloMedia page 15. For now, key will simple be the letter of tone 1, also known as the root or the tonic. For example, if we are in the key of C major, then the letter C is tone 1, and the key signature is 7 naturals. In the next lesson we will learned how to connect 12 sounds and 21 symbols on the fretboard, in a perfect 4th and perfect 5th interval sawtooth pattern. 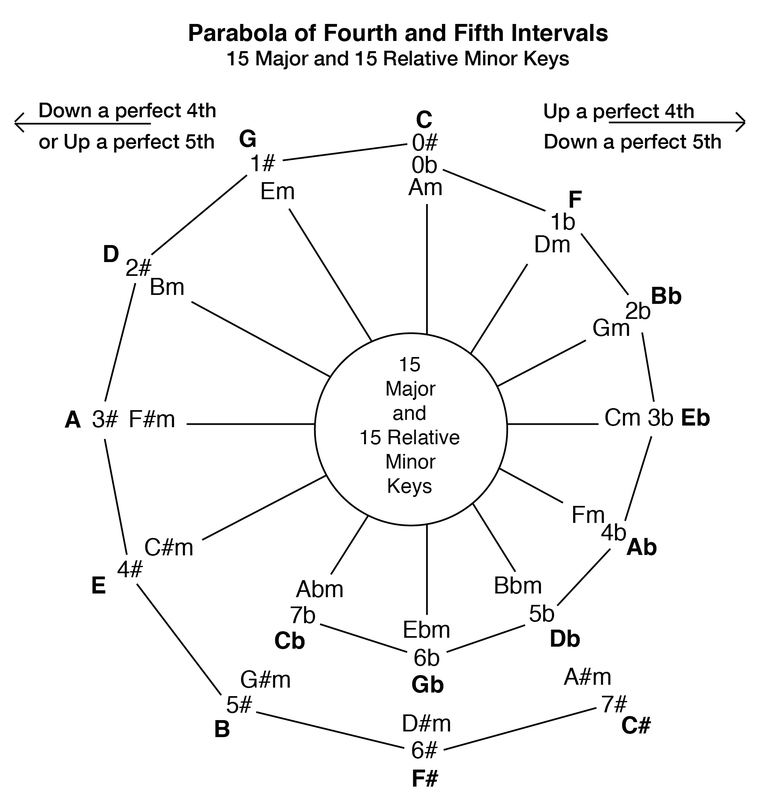 But for now, let’s illustrate this 4th and 5th interval pattern as a “circle” of 15 perfect 4th and perfect 5th related major keys and relative minor keys. It’s important to remember that up a perfect fourth arrives at the same letter as down a perfect fifth, but sounds one octave higher in pitch. In contrast, down a perfect fourth arrives at the same letter as up a perfect fifth, but sounds one octave lower in pitch. This is known as the rule of nine. What becomes apparent as we look at this new parabolic view of of 4ths and 5ths, is that the “circle” of 4th & 5th intervals is not a circle at all, but rather a parabola! Simply stated, a parabola is two curved lines that start at the same place, in this case C, but end at two different places, in this case Cb and C#. 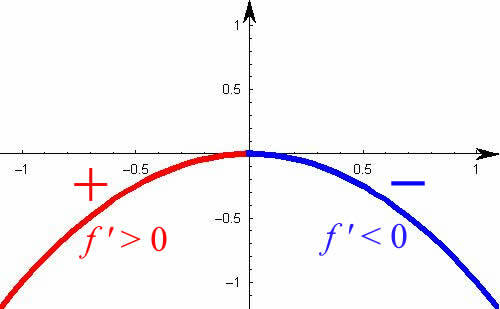 The parabola view shows us an important fact — the only way to create a circular motion is to modulate (change keys) at one of the three enharmonic keys: Db/C#, Gb/F# or Cb/B and continue in the same direction toward “home.” See Guitar EncycloMedia page 42. The point of all this will become more meaningful when we begin to explore harmony progressions. ’til next time, have some parabolic fun, no matter what key you’re in… I’ll be listening! Most parents I have met all seem to share this same basic concern: Can I really teach my child bass if I myself don’t know how to play? The joyous answer is, yes! But only if your teaching method is as simple and logical as a connect-the-dots picture. By using a music method for bass that is clear and simple, your child will stay engaged long enough to experience the rewards of a successful bass education. By learning in this connect and continue way, your child will know exactly what’s coming next and therefore will never get confused, frustrated, or even worse, want to stop and quit! In addition to the simple joys of playing bass, there are many other wonderful benefits your child will gain by learning to play bass, such as self-discipline, greater self-esteem and a higher IQ. So, I think it’s safe to say that learning music and bass would be a good idea for you and your family. Now, let’s look at a few other common questions you may have about beginning a bass curriculum in your home. What Is A Good Age To Begin Learning the Bass? Although there is no one correct answer to this question, I have found that by the age of six, children have developed enough cognitive skills to learn bass. For example, they know the alphabet, can count numbers up to 12 and higher, and most importantly, when properly engaged, can exercise the self control needed to sit with attention and awareness during a half-hour lesson. Also, by age 6 they are big enough to comfortably hold the bass and have developed the finger strength necessary to press down a bass string. It’s important to remember that at this age, when it comes to getting your child to play the bass, the enthusiasm needed must come from them, not you. That’s why it is best to begin bass instruction when your child asks to play, not later when their interest may not be as strong, or when you have determined that they should. Said a different way, never force your child to learn bass if they don’t want to. But if they want to, and if you can afford it, you will want your child to learn correctly from the beginning, so it’s very important to find a bass instructor who is effective with children. Quality instruction at this age is essential because some children tend to have short attention spans and are often easily distracted. These conditions can be correctively addressed by a qualified bass teacher who is experienced with children. They will know how to apply just the right amount of fun and seriousness so that your child finds the lessons enjoyable and exciting and will want to continue to learn music and bass. Should I Encourage My Child To Play The Bass? Of course you should! If your child comes to you and tells you that she or he is interested in playing the bass, then by all means, you should definitely encourage your child to do so. It’s equally important not to force them to play an instrument they don’t want to play. For example, if they want to learn the bass, don’t make them play the piano. You may be surprised to learn that many parents can be pushy in forcing their child to play a particular instrument because it’s the one that they played, or they feel it to be a superior instrument. Let your child choose the instrument they are interested in, even if it’s the glockenspiel! No matter what the instrument, learning to play music will help your child in many other areas of their life as well, for example, they will be able to concentrate and stay focused for longer periods of time. Learning music also enhances your child’s listening skills and teaches them that the art of continual practice leads to betterment. Lots of children want to learn to play bass and that’s understandable because many of today’s music artists play the bass. For many, this is what makes bass “cool” and therefore, learning to play bass is seen as more preferable to playing a band or orchestral instrument such as a trumpet or clarinet. So, it becomes important to remind your child that even with quality bass instruction playing bass will still be a technical challenge. It will take time to develop strong and flexible hands in order to press the strings tightly and strum the strings properly. But if your child is willing to devote the time to practice, good technique will come. 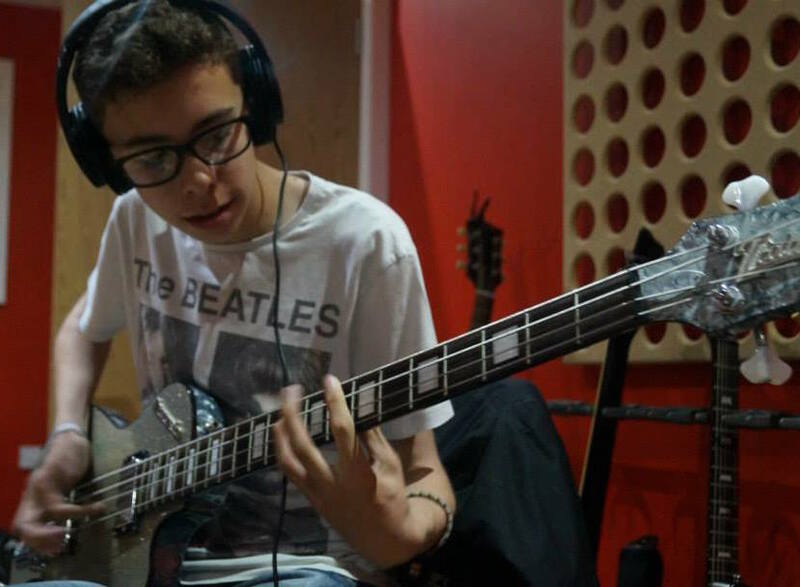 To keep them dedicated to improving their technique and evolving the dexterity necessary to become proficient at playing bass, be sure to support and encourage them often. Keep in mind that a quality instrument, a clear and in order music method, and a qualified teacher is the key to making the difference between your child quitting and succeeding. How Long Should My Child Take Bass Lessons? The simple answer is: a lifetime! We never outgrow our need for the next musical thought or technical idea. However, with this said, the answer to this question depends on what level your child wants to take their bass playing. Playing levels vary from being a hobby to developing mastery. Time will unfold a dedicated player from an amateur to a professional, or said more traditionally, from a beginner to an advanced musician. It’s important to remember that learning to play bass is different from learning to ride a bicycle. With a bicycle, you only need to practice riding until you discover balance and no longer fall off your bike. When you reach that moment, you no longer need to practice. However, when learning to play the bass, you will soon get to a stage where you can play a few simple melodies and harmonies, and if you’re happy with that, you could stop practicing at that point. But, if you would like to play more popular and complex music, you can’t stop there, you must continue to practice so that you get better and faster. In addition to being able to play many songs, with more practice you will be able to develop advanced technical skills that will have your playing sounding much more professional. And don’t forget, if you really want to become an expert at playing music on bass, you will need to practice even more. However, over time you will discover that the better you get, the more you will want to play, and the more you play the more you enjoy playing, to the point that playing bass becomes a passion. Then, you won’t be asking yourself how much longer do you have to keep practicing because playing will be the only thing you’ll want to do! How Do I Recognize A Quality Music Method for Bass? If you’re interested in learning to play bass but cannot afford a qualified private music teacher to show you the way, you might have gone online to look for bass instruction. You probably ended up being overwhelmed and confused with so many methods claiming to teach you how to play the bass in a certain number of days, if not hours or minutes! Now, you’ve heard this before, if something sounds too good to be true, then chances are, it’s not true. Just because the method is published by a big company, is backed by lots of bells and whistles, has a flashy website with all the latest technology, comes with a 60 day money back guarantee and has more fake testimonials than you have time to read, doesn’t mean that the content is complete, connected in-order, or will lead to success. 1. Goes to the music store and buys a bass and a traditional beginner’s bass method book. If you study the options, you’ll discover that it doesn’t matter what brand of method book you buy because they are all the same! But don’t believe me, visit the music store and look through the top-selling bass methods and you will see for yourself that they all present the same lesson plan. This isn’t because they succeed, in fact they don’t, it’s because the authors and publishers are vested in making sales rather than investing the time and money necessary to develop a music method for bass that really does succeed. 2. Takes the bass and the method book home and quickly becomes overwhelmed and confused. This common experience is the result of incomplete and out-of-order instruction. At this point, many beginners decide that learning bass is too difficult for them and they quit, or, they blame themselves for not understanding or, they blame the author and go back to the music store to buy a different beginner book. 3. But nothing has changed, the same confusion and frustration is experienced and again they decided that bass is too hard for them, they blame themselves and the author and quit or, in rare cases, decides to try it one last time. But once again, the result is the same and finally the bass is pushed under the bed and forgotten. I’ve witnessed many promising beginners go through this cycle and then give up and choose to do something that they know they can do, but it’s usually something which has no real benefit or lasting value… like video games! Don’t let this happen to your child. Get them a quality instrument, a complete and in-order music method for bass, for example: the Tone Note® Music Method for Bass Book 1, a qualified teacher and encourage them to experience the joys of learning music and playing bass in a revolutionary new and successful way. ’til next time, have some fun learning bass at home… I’ll be listening! You are currently browsing the 12tonemusic blog archives for January, 2015.